This is one of those things that you know everyone else has gone through and to complain about it marks you as naive and pedestrian, but you can’t help thinking, Moi? Why me?? We went through what seemed like everywhere in LA. Long Beach Museum of Art. Marvimon & Smog Shoppe. Inn at the Seventh Ray. Griffith Park. Franklin Canyon. Gillette Ranch. Orcutt Ranch. And on and on…After weeks and weeks of crazy Googling and phone calls and requests for help from friends, we thought we had the perfect venue. 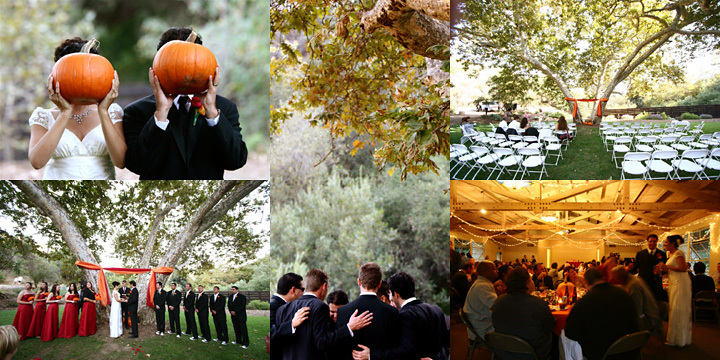 “The perfect venue” for us is a tall order–and I know everyone says that too. We were looking for: a) inexpensive b) inside & outside spaces because the reception is in February and we worry about rain c) a raw space d) not a reception/banquet hall, hotel, or anything with brocade and crazy carpeting e) allows alcohol f) BYO catering and g) access to nature–which is not impossible, but somewhat difficult to come by in LA County. We thought we found it in Temescal Gateway Park, which not only fit everything, but also had hiking trails and cabins for rent that we knew would have been great with our guests. Immediately after finding the place online, I did what you should never, ever, do which was start envisioning everything. I could see us renting the bungalow and setting up the tables the morning-of. I could see people drinking beer and playing bocce ball on the grass. I thought of things like pinatas for the kids and where a photobooth would go (perhaps some vintage-patterened fabric strung up between the two trees?) and I saw papel picado strung up from the rafters. And then, as you can guess, it turns out Temescal is hosting some big conference our weekend and “so sorry we can’t help you,” their lovely Event Coordinator told me. Point taken. And it’s a good thing to remember the first time we go house shopping and this sort of thing is bound to happen again (note to self: don’t start envisioning your kids on the lawn until escrow is done and your names are on the dotted line). So here I am, back at square one, but ready, I think, to envision something new. And besides, there has to be something else besides the 2,000 sites I’ve already rejected, right?…Right?? Sigh. This entry was posted in Musings, Weddings and tagged reception, temescal gateway park, venue, wedding, wedding reception planning. Bookmark the permalink.